"It was harder than it looked from the ground. The main corner crack flared out and turned into an offwidth, and the right wall was void of foot placements. It took some super-wide bridging to the thin crack off on the right to make upwards progress." 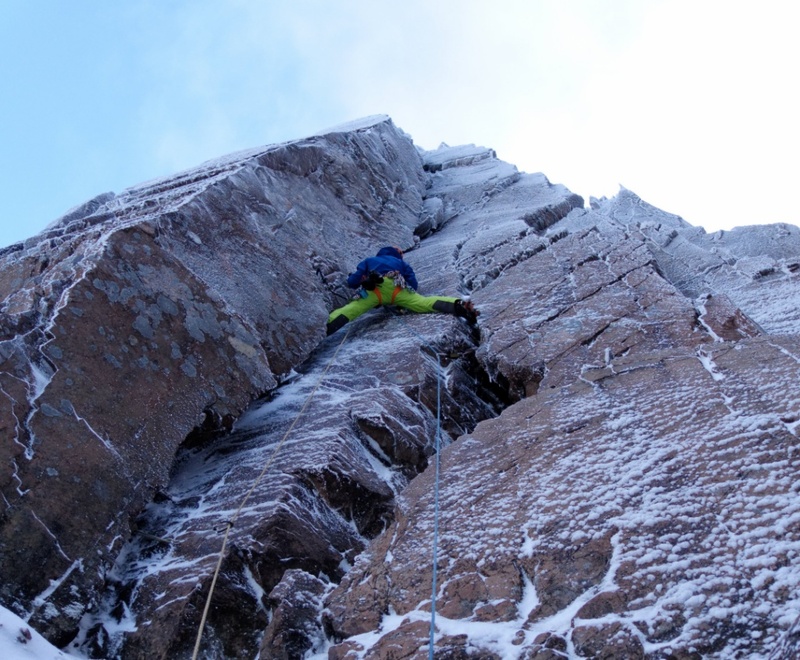 Jöttnar Pro team member Willis Morris could sense the onset of Scotland's delayed but much anticipated winter. 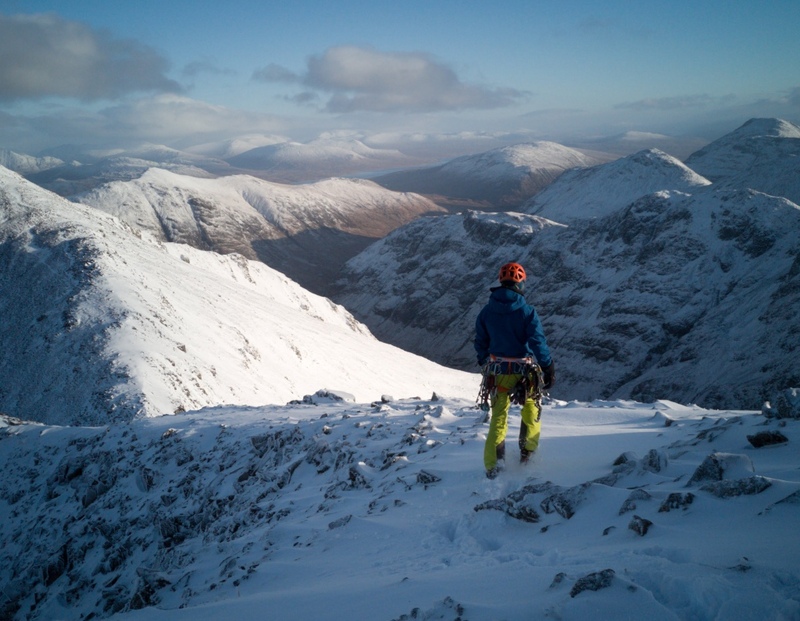 With forecasts and social media chatter aligning, leave from work was taken along with friend Nicholas Wylie to allow a mid-week raid into Glencoe. 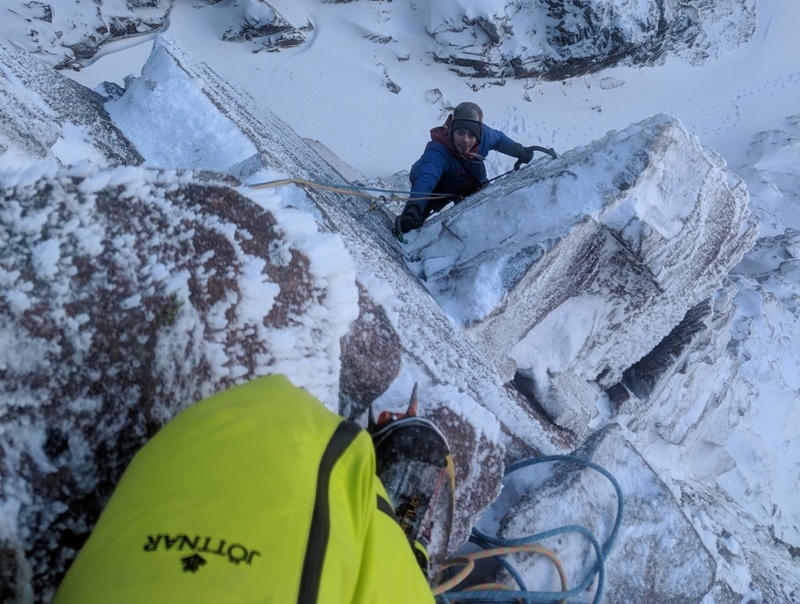 Initial disappointment gave way to contentment as a fought-for First Ascent went into the bag on this first winter outing of Willis's season. 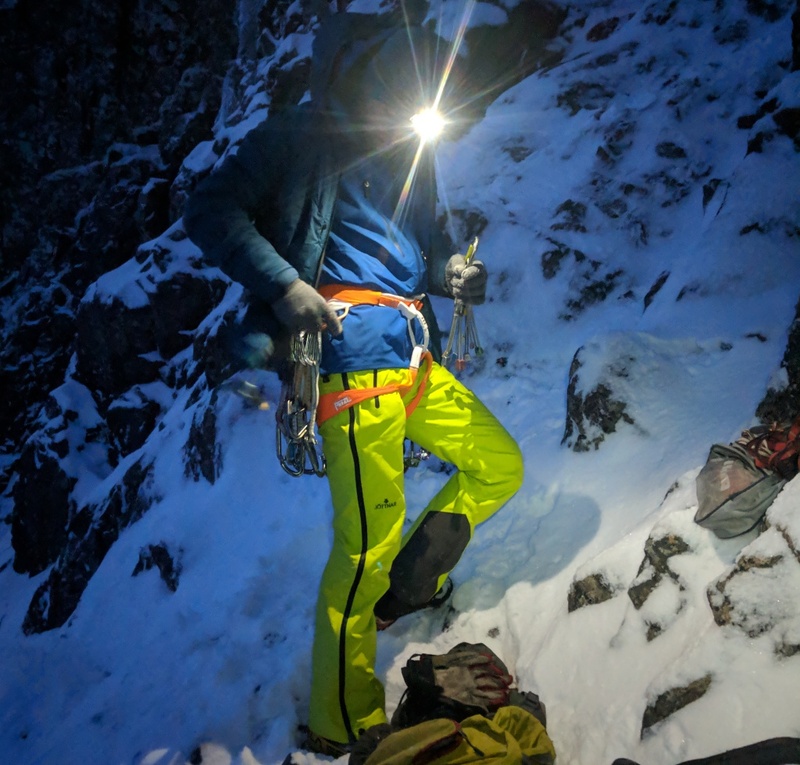 Nick and I headed north to Glencoe on Wednesday night after catching glimpses of good conditions on social media and promises of more snow and cold through to the weekend from all the forecasts. Our first taste of winter this season, we opted for an early start, our excitement fuelled by the sight of white tops against the dark morning skyline. Two hours of suffering against the never-ending treadmill of powder on scree and we finally arrived at the base of Church Door Buttress, only to be unpleasantly surprised. It wasn't in. It had snowed down to the valley floor through the night and yet even with the howling Northerlies that shook the van as we slept, the bottom pitches of the crag were still black. Nightmare! With the sun rising and a bluebird day evident we were determined not to bail empty-handed. We racked up and headed up Central Gully with the plan to check out some routes for a return trip whilst still bagging something easy that made it to the summit. It took less than 100m of ascent to pass the temperature line where the hoar had set on the walls around us to suddenly realise that our disaster of a morning still had the opportunity to blossom into a successful day's climbing. Everything up there was white! But then we spotted a clean looking needle of rock dead-centre in the gully. With a steep corner on its right and a crack running ground to summit, it would have been rude not to have made the most of it and have an effort. Although I'd never ventured this far up at the crag, I'd heard the majority of the steep walls that stand over the gully were chossy and of little worth for hard climbing. This proved true when every option that we thought looked possible from afar, was quickly disregarded after closer inspection. But then we spotted a clean looking needle of rock dead centre in the gully. With a steep corner on its right and a crack running ground to summit, it would have been rude not to have made the most of it and have an effort. At only one pitch the route is nowhere near the length of the classics at the crag but still manages to pack a punch to make it a worthwhile climb. We found it to be harder than it looked from the ground, with the main corner crack flaring out and turning into an offwidth. With the right wall void of foot placements, it took some super-wide bridging to the thin crack off on the right to make upwards progress. In total it provided 35m of steep, safe and technical climbing - and a great load of fun. An hour of battling the hot aches and pumped calves (nothing like the first route of the season to remind your calves about the existence of front points) I made the shout of "safe!" down to Nick, and pulled the ropes tight for him to follow. 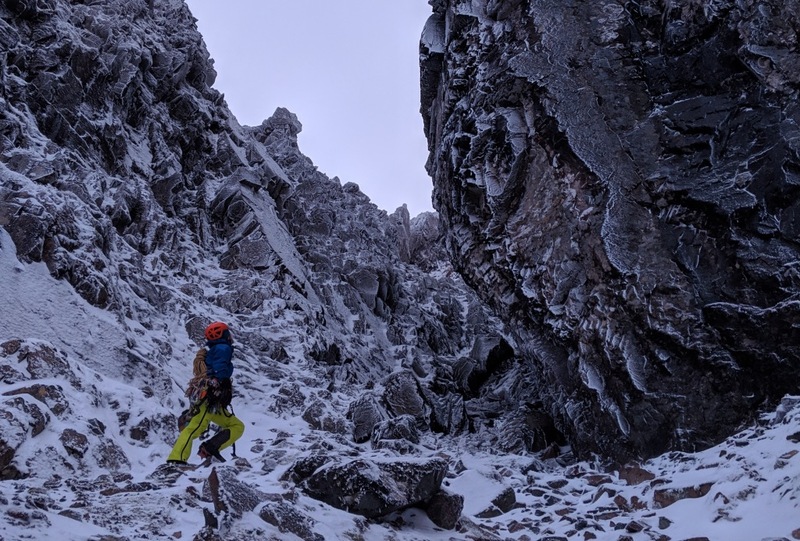 If, like us, you find the lower pitches of the classics aren't quite in or you just fancy some shelter within the gully from some brutal conditions outside, it makes the long walk-in worthwhile and is much better than a day bailing empty-handed. After speaking with a few others in the know and a little bit of research, we believe it to be a first ascent. As it stands alone from the other routes at the crag, we opted for the name 'Lonely Angel', thus keeping in trend with adjacent route names. Willis Morris is a member of the Jöttnar Pro Team. Click here to read more about him, and here to watch a short film of him learning how to speedfly in the Scottish mountains. Products worn in these photos - Odin shell jacket, Elvar mid-layer and Vanir LT pant.